For Arsenal fans, it has been a long summer full of false hopes, destroyed dreams and never ending frustration, however now comes the final week of the window, it seems that Arsenal are now in pole position to make one of the biggest transfers of the summer. 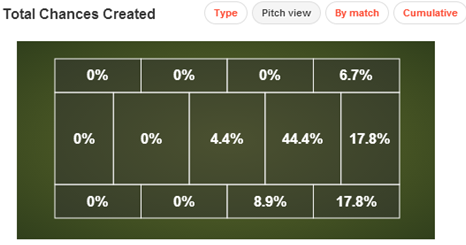 Di Maria, when operating from the right hand side, is a winger who enjoys coming infield onto his favoured left foot. A large part of his game when playing as an inverted winger is based on his ability to drag his marker out of position until they pass him on, it is then when Di Maria becomes a threat from a central area. His ability to make space for himself using a variety of quick ball movements between his feet, in combination with excellent balance and ability to feint, gives him many opportunities to strike on goal or lay on a pass to a team mate. When operating from the left hand side, he becomes a more traditional winger. He uses his pace and dribbling ability to get to the touchline and cross, rather than look to come inside where his dribbling foot is closer to the defenders. For a short period during the 2011/2012 season, the then manager of Real Madrid, Jose Mourinho, used him as an attacking midfielder in a 4-2-3-1 system, he performed remarkably well, and displayed his passing and dribbling abilities to great effect, as well as showing a discipline and work ethic that is needed from the modern day attacking midfielder. Mourinho often made Di Maria a key component in the big games; this was due to knowing he could trust Di Maria’s intelligence and understanding of the game in key situations. This was evident in the games Di Maria featured against Barcelona, Di Maria was always a key part in the counter attacking and high pressing philosophy Mourinho wished to imposed in these games. His versatility has proved a valuable asset for his national team, being used in a multitude of attacking roles in order to best accommodate Lionel Messi. However, Di Maria, wherever deployed has always been noted for his extremely good work rate, technical proficiency and intelligence. During this season, Di Maria scored 6 goals and provided 11 assists in the league. More impressive was the fact that he provided 70 goal scoring chances (average of 2.0 per game) for his team mates, that was more than Cristiano Ronaldo and Lionel Messi however was less than Mesut Ozil, Juan Mata and Santi Cazorla. Di Maria was also a productive dribbler of the ball, accumulating a total of 67 successful dribbles during the season. This season, Di Maria scored 5 goals and provided 15 assists in the league despite only starting 16 games due to injury. Di Maria was much improved in his consistency and also his tactical awareness during this season. His improvement meant he was given a position as the central attacking midfielder during a short stint midway through the season. He displayed excellent playmaking abilities but more importantly, a discipline and intelligence in the defensive transitions. He recorded a passing accuracy of 75% which is a good percentage for a player who plays directly and incisively. Finally, Di Maria provided 43 chances in the 16 starts (7 substitute appearances). This season was extremely turbulent for Di Maria and for Real Madrid in general, Di Maria recorded 7 goals and 6 assists in the league. He also laid on 45 chances to his team mates in the 22 games he started (10 substitute appearances). This image displays where Di Maria created his chances from. As stated previously, Di Maria, despite playing on the right, enjoys coming infield into the central zones and create from there. Something that will be explained later is the pattern of play which Real Madrid used, and it involved Di Maria moving to the left to very good effect. Arsenal has struggled to create chances consistently as they once did, and often have played too slowly which has led to a breakdown in possession. Slowly, Arsenal have become more efficient in their counter attacking play which has given them a new form of offence which was missing in the last few season, Di Maria excels in this art. Di Maria provides depth and competition to the three areas where they need it, both wide berths and attacking midfield. Santi Cazorla and Theo Walcott have both played excellently in their respective wide roles, which leaves the attacking midfield spot to be cemented by a player. 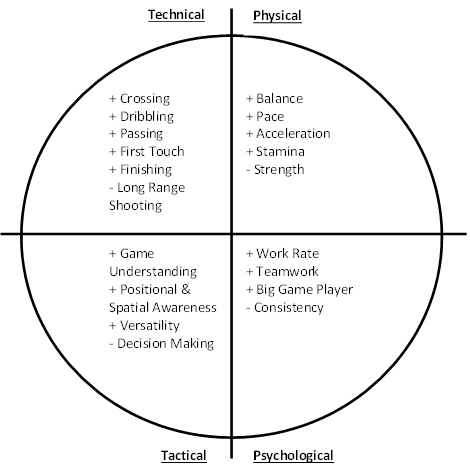 There are many benefits to Di Maria being deployed in this position, should he join Arsenal. During the Fenerbahce vs. Arsenal Champions League qualifier, Cazorla, who was deployed on the left, and Rosicky, who was deployed in the middle, often swapped positions and it created a fluid approach to the Arsenal attack. There were many occasions during the game where Fenerbahce went to a zonal defensive approach due to the movement of both players, this gave more freedom to Cazorla to dictate the tempo of the match, create spaces and provided incisive passes in dangerous areas. However, despite this, Rosicky had a quiet game and Gibbs was the most penetrative player on the left hand side and got a goal for his efforts. During the 2012/2013 season, Mourinho had a consistent pattern of play which Real Madrid used. The first stage was for Arbeloa (who is often unmarked on the right hand side due to opposition defences wanting to defend narrow) to move up which allowed Di Maria to move across the attacking line to the left hand side. As he moved across to the left, Khedira made runs on the right hand side to assist Arbeloa and Ronaldo moved from the left to support Benzema or Higuain centrally. Di Maria was crucial in this pattern of play, as his combination play with the left back (Coentrao or Marcelo) were key in the delivery and chance creation while both Benzema/Higuain and Ronaldo were in the box. Efficiency in possession during this transition was critical as players were moving and altering the shape, which left Real Madrid susceptible to counter attacks through the middle. Di Maria fulfilled his role brilliantly; one example is his assist for Ronaldo in the Champions League game against Real Madrid at the Bernabeu. Combining the two scenarios, playing Di Maria in the middle with Cazorla on the left can create a very creative combination. The high level of technical quality between them will eclipse anything that Arsenal can put out in combination, and with Di Maria going to left to fill the unmarked space that Cazorla leaves, it gives Di Maria the perfect opportunity to display his crossing skills with his stronger left foot. Another benefit to Di Maria playing as the central attacking midfielder is his natural tendency to drift to the right hand side of the attack to again come infield unmarked. This is the opposite to the more traditional drift of a right footed playmaker who drifts to the left side to come onto their stronger right foot. By going over to the right as opposed to the left, there are more opportunities to thread passes into Walcott’s infield runs between the central defender and the fullback. Predictability was a big issue at Arsenal last season, the tempo being too slow and the passes being too simple. Di Maria is a player who can eradicate those issues, his technical ability would increase the efficiency when Arsenal are in possession, his tactical intelligence will improve Arsenal’s fluidity and creativity in harder games. His physical potency is a massive bonus for Arsenal and has proven on many occasions that he is ready to take responsibility on the big occasions. In conclusion, Arsenal should do everything they possibly can to ensure that they sign the Argentine. The variety he would give to the Arsenal attack are endless, as well as his willingness to work backwards. He suits a counter attacking philosophy, but has the technical ability to suit a possession side as well. Arsene stated that he was looking for versatility in his new signings and that is what Angel Di Maria provides, not only has be played in all 3 attacking positions prior to this season under various managers, but he was also deployed in more central areas in an experimental 4-3-2-1 formation during Ancelotti’s first preseason with Real Madrid. Whatever the reported fee may be, Arsene and his team will do well to secure his signature. Thanks to Whoscored.com and Squawka for their data and images.